A warmer Arctic means big changes for sea ice and the animals that depend on it. But a new paper shows how warmer ocean temperatures are impacting animals on land in the Arctic as well. “As temperatures are warming, what we’re seeing is that events that are weather triggered offshore are having onshore consequences on land mammals,” Joel Berger, a biologist at Colorado State University, said. Berger studies polar bears in western Alaska and Russia’s Wrangel Island in the Chukchi Sea. But he has a special place in his heart for another Arctic animal. The muskox is basically a giant circumpolar goat. It’s well adapted to living in the far north. It hunkers down in the winter, conserving energy by not moving around a lot — a kind of waking above-ground hibernation. It also has a long coat and special woolly undercoat called qiviut. Berger says it’s eight times warmer than sheep wool — perfect for winter field work on the tundra. For thousands of years muskoxen have dealt with all the blows of the Arctic. Rain on snow. It sounds like something that happens in Juneau every week during the winter. “Your listeners are going to be thinking ‘What? We get this all the time. Why is that a problem?’” Berger said. It’s a problem because rain in the Arctic instantly turns to ice when it hits the frozen ground, trapping the low vegetation muskoxen depend on. But this isn’t having the effect you might think. They’re not starving to death. It’s a problem for pregnant muskoxen. At the end of their pregnancy — in February, March and April — the rapid growth of their babies is most susceptible to being impacted by rain on snow events. And when there’s diminished food for the mother during this last trimester, Berger says her babies are “runtier”. When his team measured them at one, two and three years old, they had smaller heads than others whose mothers experienced fewer rain on snow events during pregnancy. In general, smaller animals have higher mortality rates and if they survive, they reproduce at lower rates. Which means that one winter storm in the Arctic that brings rain instead of snow, can result in a nutritionally deprived baby that will have lower odds of growing up and reproducing. The ripple effect here, you can see, is serious. 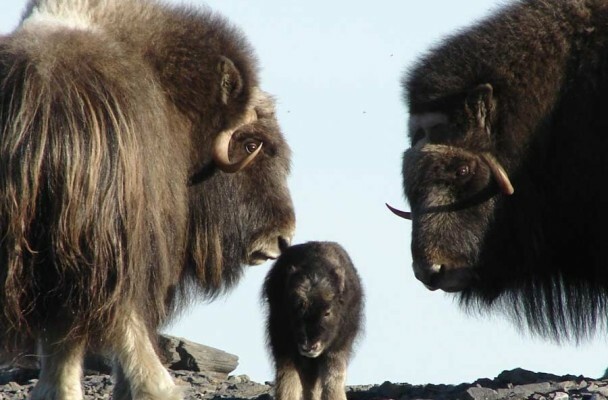 “Even subtle rain on snow events can have these prolonged effects on young muskoxen,” Berger said. So far, Berger and his team have tracked these impacts on the first 3 years of the animal’s life. And they’ve seen that a three-year-old muskox will still carry the impact of a rain on snow event that happened when it was in utero. Berger is on his way back to Wrangel Island in Russia in a few weeks. He’ll see how the four-year-old muskoxen are faring. It’s unknown whether these runty individuals will be able to make up for their small size later in life.